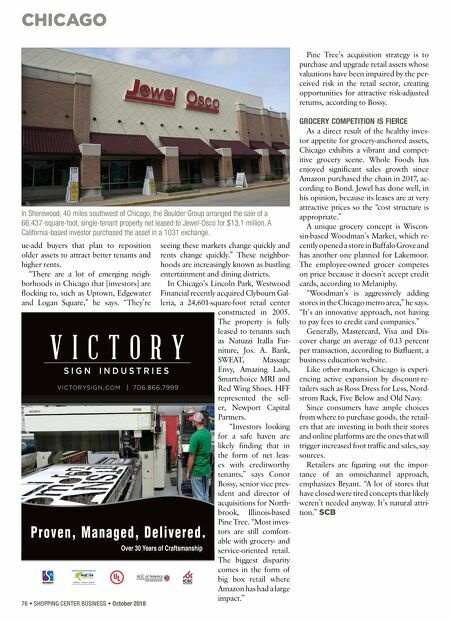 CHICAGO 76 • SHOPPING CENTER BUSINESS • October 2018 ue-add buyers that plan to reposition older assets to attract better tenants and higher rents. "There are a lot of emerging neigh- borhoods in Chicago that [investors] are flocking to, such as Uptown, Edgewater and Logan Square," he says. "They're seeing these markets change quickly and rents change quickly." These neighbor- hoods are increasingly known as bustling entertainment and dining districts. In Chicago's Lincoln Park, Westwood Financial recently acquired Clybourn Gal- leria, a 24,601-square-foot retail center constructed in 2005. The property is fully leased to tenants such as Natuzzi Italla Fur- niture, Jos. A. Bank, SWEAT, Massage Envy, Amazing Lash, Smartchoice MRI and Red Wing Shoes. HFF represented the sell- er, Newport Capital Partners. "Investors looking for a safe haven are likely finding that in the form of net leas- es with creditworthy tenants," says Conor Bossy, senior vice pres- ident and director of acquisitions for North- brook, Illinois-based Pine Tree. "Most inves- tors are still comfort- able with grocery- and service-oriented retail. The biggest disparity comes in the form of big box retail where Amazon has had a large impact." Pine Tree's acquisition strategy is to purchase and upgrade retail assets whose valuations have been impaired by the per- ceived risk in the retail sector, creating opportunities for attractive risk-adjusted returns, according to Bossy. GROCERY COMPETITION IS FIERCE As a direct result of the healthy inves- tor appetite for grocery-anchored assets, Chicago exhibits a vibrant and compet- itive grocery scene. Whole Foods has enjoyed significant sales growth since Amazon purchased the chain in 2017, ac- cording to Bond. Jewel has done well, in his opinion, because its leases are at very attractive prices so the "cost structure is appropriate." A unique grocery concept is Wiscon- sin-based Woodman's Market, which re- cently opened a store in Buffalo Grove and has another one planned for Lakemoor. The employee-owned grocer competes on price because it doesn't accept credit cards, according to Melaniphy. "Woodman's is aggressively adding stores in the Chicago metro area," he says. "It's an innovative approach, not having to pay fees to credit card companies." Generally, Mastercard, Visa and Dis- cover charge an average of 0.13 percent per transaction, according to Bizfluent, a business education website. 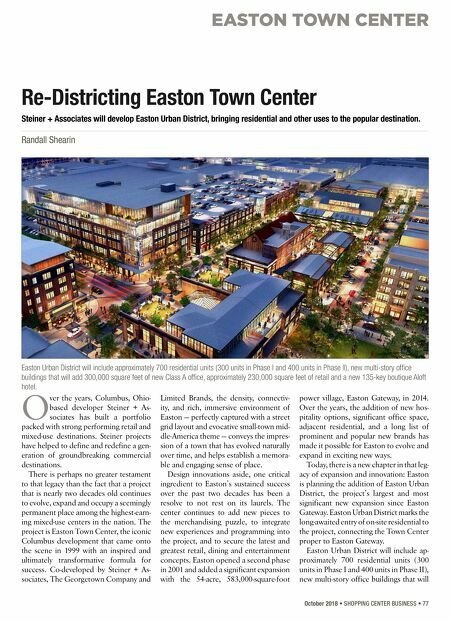 Like other markets, Chicago is experi- encing active expansion by discount-re- tailers such as Ross Dress for Less, Nord- strom Rack, Five Below and Old Navy. Since consumers have ample choices from where to purchase goods, the retail- ers that are investing in both their stores and online platforms are the ones that will trigger increased foot traffic and sales, say sources. Retailers are figuring out the impor- tance of an omnichannel approach, emphasizes Bryant. "A lot of stores that have closed were tired concepts that likely weren't needed anyway. It's natural attri- tion." SCB In Shorewood, 40 miles southwest of Chicago, the Boulder Group arranged the sale of a 66,437-square-foot, single-tenant property net leased to Jewel-Osco for $13.1 million. A California-based investor purchased the asset in a 1031 exchange.